Retrofitting and Bolting of New Houses? 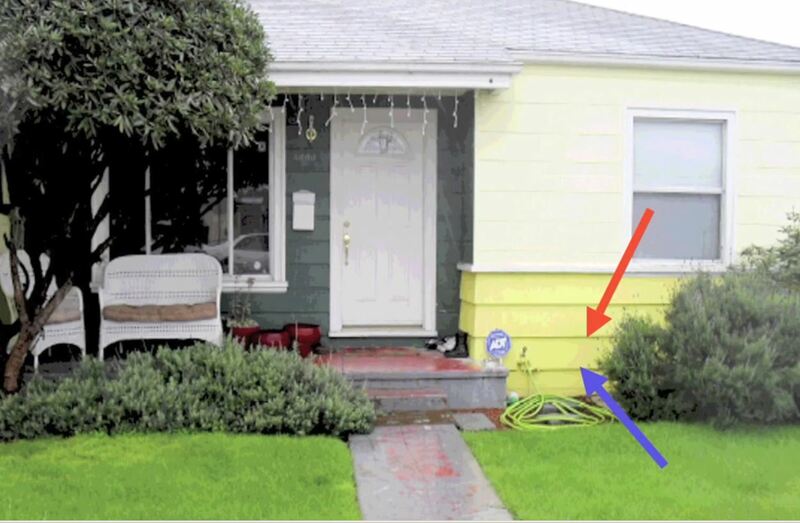 Many newer homes built on flat lots (for us new means built after 1958) such as those found in San Jose, Fremont, Santa Clara County, and much of the Peninsula may need additional bolting because of two serious deficiencies: one created by the California Building Code and the other by common construction practices. One deficiency has been part of the code since its inception in 1927. The other deficiency is caused by over-sized holes, of which contractors are invariably guilty. These deficiencies are discussed below. 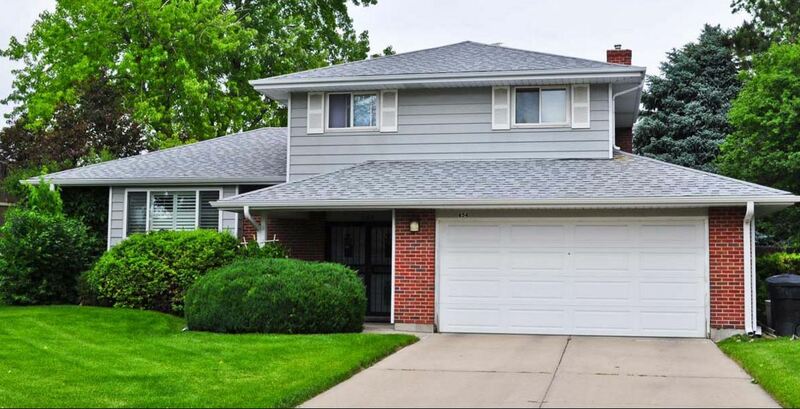 Newer houses on flat lots, even if they are not retrofitted, have a very low incidence of serious structural damage. 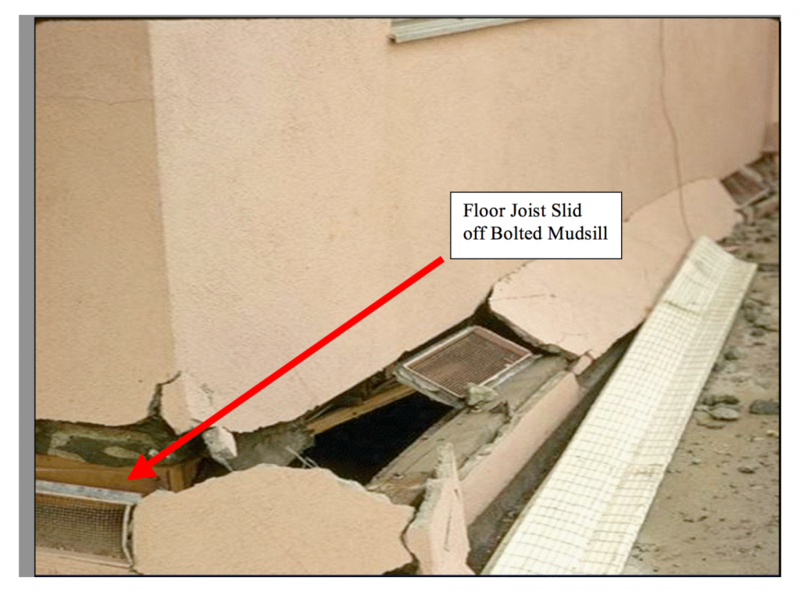 While working with FEMA the author did not document a single newer bolted home that suffered catastrophic damage. This is not to say damage did not occur. 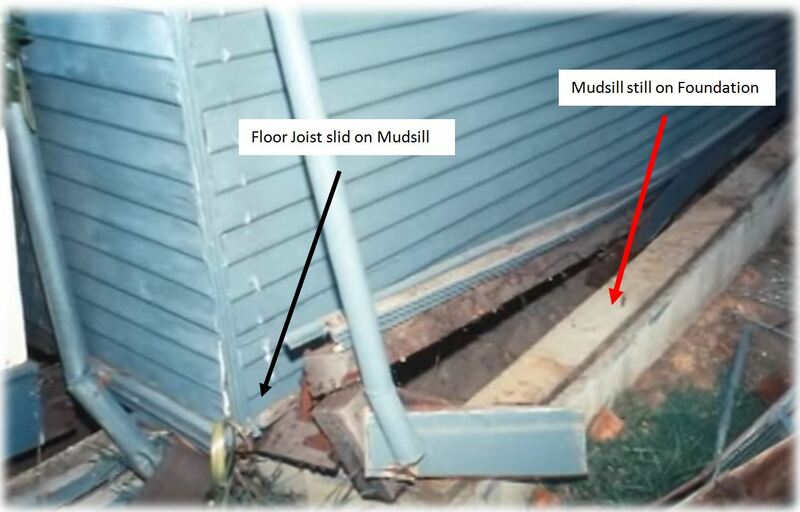 The primary failure was due to mudsills splitting because the bolts were placed in oversized holes, though as shown by the photos below it is possible for the entire floor to slide off the base of the house. In the case of houses being damaged by oversized holes, a house would normally move an inch or so on the foundation and the house would still be fully habitable once water and gas lines are repaired. All of this is being mentioned to point out that the likelihood of catastrophic damage is close to zero, that you will still have adequate shelter after an earthquake, that if damage does occur it should be readily repairable, and in my opinion this type of retrofit should only be considered if you want to make absolutely sure your house only suffers very minimal damage. Even though no one can say for sure what will happen, this information is based on empirical evidence from previous earthquakes. I hate to talk you out of giving us a job, but you need to know what you are paying for. What this means is that wherever the Joists or girders sit on top of the mudsill, only 3 nails need to be installed in order to meet the legal requirements of the building code. Before the advent of nail guns when driving nails was arduous, contractors would only meet minimum building code standards to increase speed and save their bodies. The result is that houses built before 1978 when nail gun use became pervasive can have a serious structural deficiency. 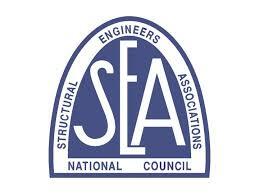 TO COUNTERACT THIS FORCE SPECIAL HARDWARE CALLED SHEAR TRANSFER TIES OR FRAMING ANCHORS ARE USED. This is how Shear Transfer Ties work. 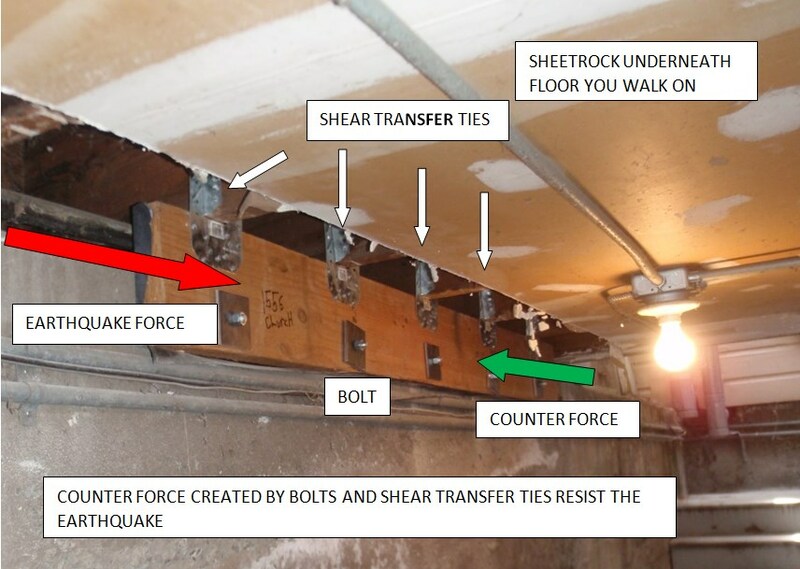 Each of the numerous types of Shear Transfer Ties used in a retrofit can resist a certain amount of lateral earthquake force based on an engineering formula called the base shear formula. You want this hardware, or a combination thereof, to resist the force that will be attacking your house. How much that force will be is discussed in the video at the top of the page. 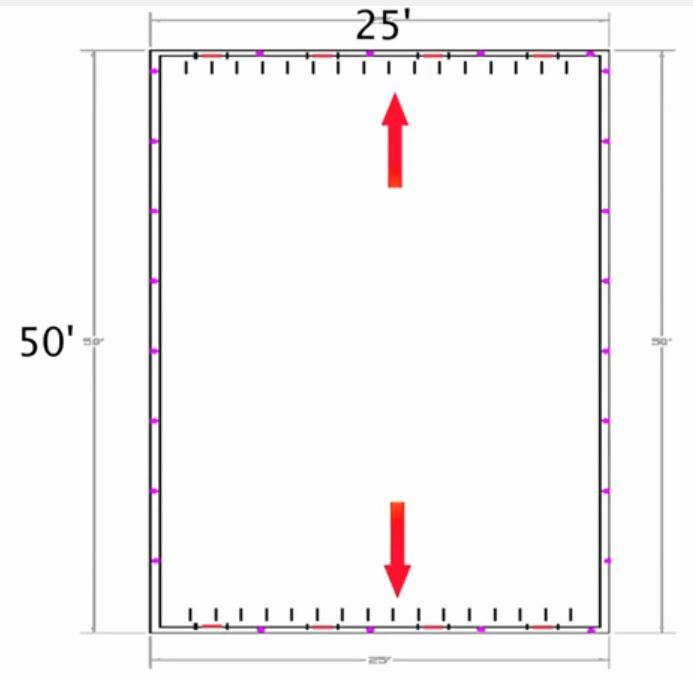 A large variety of shear transfer ties are available and a contractor must know which one to use when confronted with every imaginable framing configuration. 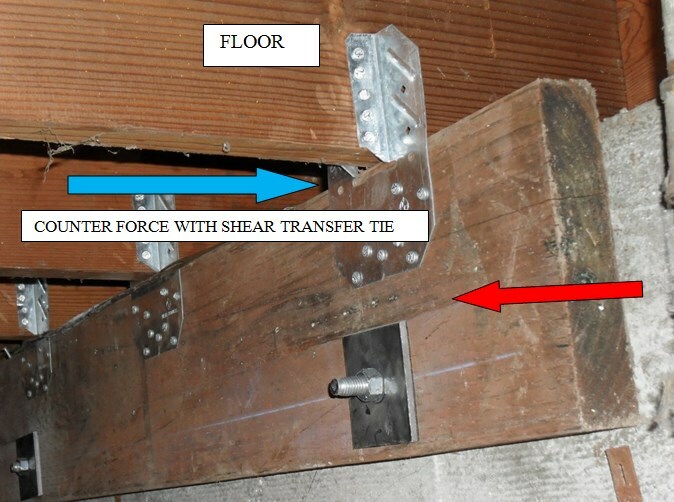 Given many houses were built without a building code, the varieties of floor framing are legion.Below are the types of Shear Transfer Ties available.L70, L90, LS70, LS90, A23, A35,LTP4, H10R, H10, H2.5, toenails, lag bolts and more. Without Shear Transfer Ties this is the kind of damage a house might suffer. The houses below had a bolt every 4 feet but the end joists were not attached to the mudsill with nails or Shear Transfer Ties. According to the 2016 California Building Code, bolts may not be installed in mudsill holes that are more than 1/16 inch larger than the diameter of the bolt. 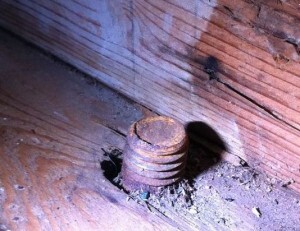 Virtually all existing bolts have over-sized holes and are in violation of the code. style=”text-align: center;”>Why do Bolted Houses have Over-sized Holes? Contractors invariably drill holes into the mudsill that are much larger than the diameter of the foundation bolt so that the mudsill can be adjusted side to side or back and forth. As you can see in the image below, when a foundation bolt has over sized holes the bolts do not work together when the earthquake hits. Instead only one bolt works at a time and the bolts fail sequentially. 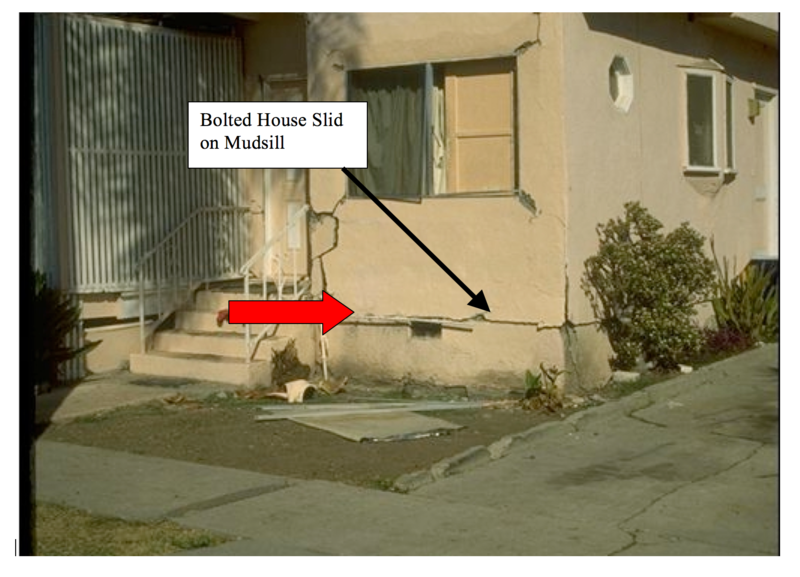 One of the most common types of damage in the 1989 Loma Prieta and the 1994 Northridge earthquakes was splitting of the mudsills caused by foundation bolts in over-sized holes. Bolts installed in over-sized holes are half as strong as bolts installed in code approved holes. When designing your retrofit consider these bolts as being only half the strength of properly installed bolts. The only way to compensate for this is to add more bolts. Most homeowners choose to re-bolt the house because re-bolting costs about the same as bolting it all over again. The cost is all in the labor and if a crew is already under the house the difference between partial bolting and completely new bolting is the same. Foundation Anchors hold the mudsill to the foundation exactly as a bolt would. 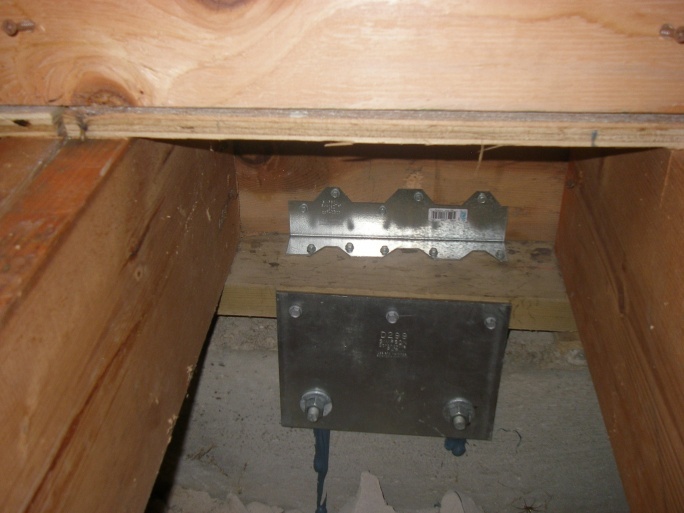 The shear transfer ties attach the rim joist and end joists to the mudsill. In new houses the mudsill is bolted to the foundation before the floor is nailed on so that there is plenty of room and the process is fast. Once the floor you walk on is nailed to the joists it is a time consuming and expensive procedure requiring of high cost hardware and work in cramped quarters. Foundation anchors do the same thing as foundation bolts. There are four types of Foundation Anchors and three types of Shear Transfer Ties. 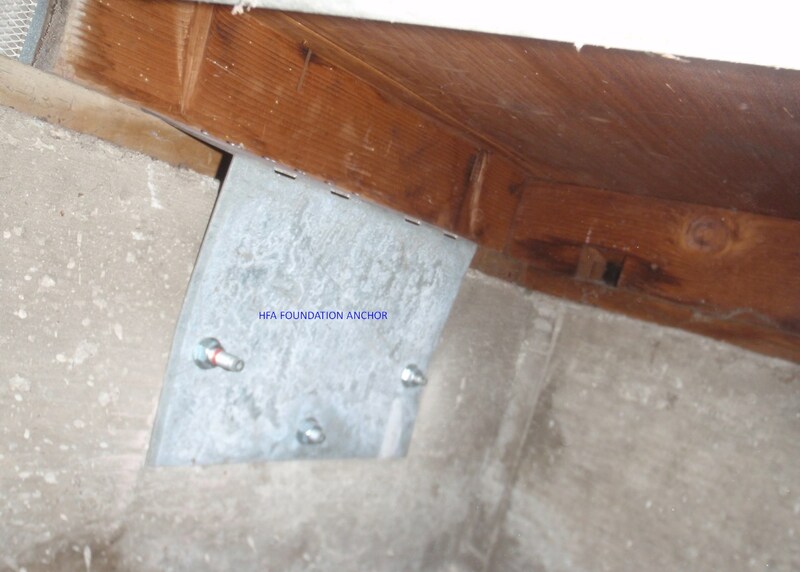 The specific Foundation Anchor or Shear Transfer Tie hardware used is determined by the floor configuration under a house. Given the fact there were no building codes when many of these house were built one does not know exactly which hardware will work and how much is needed until work on the house has begun. A load path is defined as the method by which the lateral forces of an earthquake are transferred into the ground. The colored arrows below correspond to the correspond to the colored arrows in the photo to the right. 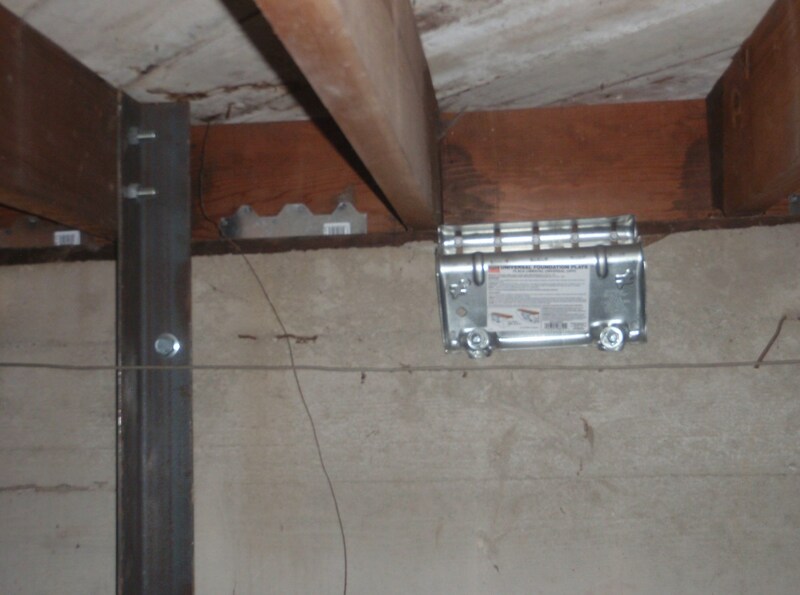 The retrofit hardware transfers the earthquake force from the floor, through the Shear Transfer Tie, into the Foundation Anchor, into the foundation, and finally into the ground where the earthquake force dissipates. This process is known as the load path. Below is a Foundation Anhor next to something called an Angle Brace or Angle Iron. Angle Braces are commonly recommended by contractors and engineers even though their ability to resist earthquakes is extremely elimited based on Analyses of some very high powered structural engineers with decades of experience. They were evaluated by the City of Los Angeles when they were developing their retrofit guidelines and rejected as ineffective. One Foundation Foundation Anchor is 5 Times Stronger than an Angle Brace. There are many kinds and types of Foundation Anchors depending on how and when the house was built. Foundation Anchors do the exact same thing as foundation bolts but were not installed at the time of original construction. The Foundation Anohor Belwo is used when the Foundation Anchor must be Attached to the Top of the Mudsill. This can Happen for Various Reasons. This is a Photo Graph of the Foundation Anchor Illustrated Above. It often happens Foundation Bolting Hardware or Shear Transfers Ties for various reasons. In these cases custom solutions must be developed. 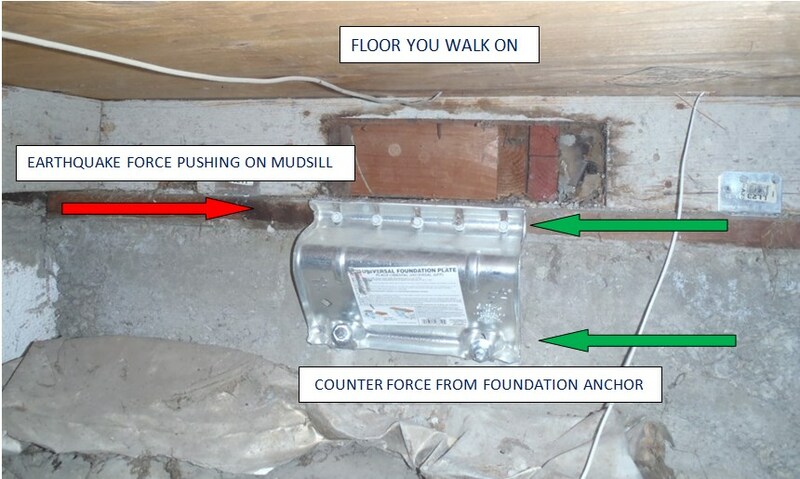 The most common approach is to Bolt a New Mudsill to the Side of the Foundation and Attach the Floor to it. Below is an illustration of the foundation of a common rectangular house viewed from above. When the bolts are placed the code-required 6 feet apart then the 25-foot-long foundations will only have 4 bolts each. The 50-foot-long foundations will have 8 bolts each. Earthquake forces strike a house from all sides equally. An earthquake force represented by the green arrow is resisted by a total of 8 bolts, 4 bolts on each side. The force represented by the red arrow is resisted by 16 bolts, 8 bolts on each side. This means the green arrow earthquake force will cause the bolts to fail with only half the force the red arrow bolts can resist. In other words the bolt strenght resisting the green arrow force is only half that provided by the bolts resisting the red arrow force If 4 more bolts are added to the shorter walls that currently have 4 existing bolts, these 8 bolts will give the short walls just as much strength the as long walls, thus making the house twice as earthquake resistant as it was before. 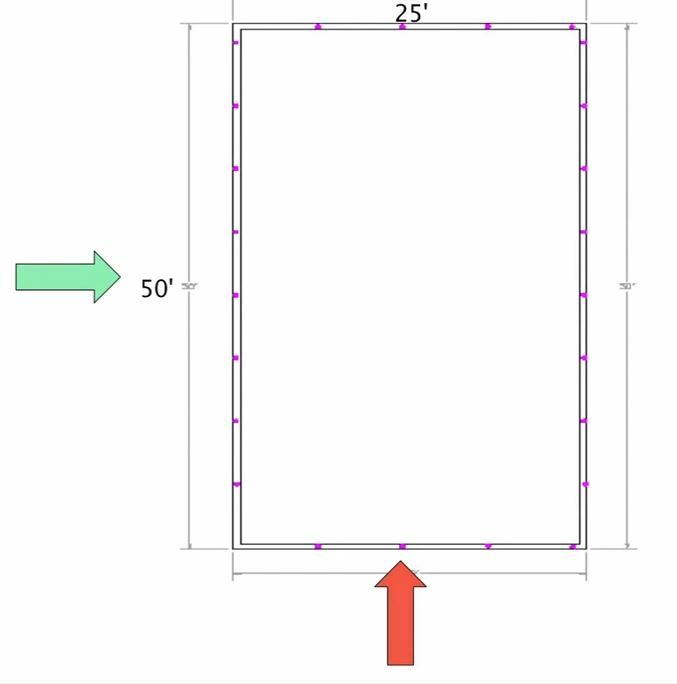 Please look at the illustrations below as we again explain how the bolting portion of a house like this can be retrofitted. 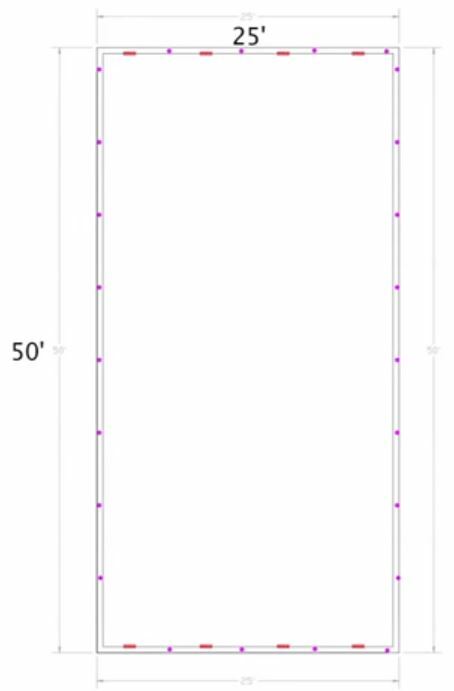 If we put 4 additional bolts on the top and bottom we will have 8 bolts on each side and the 25′ walls will now be twice as strong as they were before. The short walls which were half as strong as the long walls are now just as strong. This additional strength has doubled the earthquake resistance of the house. The red lines seen next to the bolts represent Foundation Anchors which do the same thing as bolts. At the beginning of this page we were discussing how on the short walls it is possible that only 3 nails attach the floor framing (joists) to the mudsill. The short black lines represent Shear Transfer Ties which correct this problem. Remember, the long walls already have enough nails connecting the floor to the mudsill so we don’t need to do anything here. The red lines in between the bolts represent Foundation Anchor bolting hardware. This house is as prepared as it can be without adding extra bolts everywhere. The current 2016 California Building Code contains a specification that make homes “built to code” vulnerable to earthquakes. Only 3 nails need to be used to connect the floor to the foundation on two sides of the house to meet the requirements of the building code. This is inadequate. 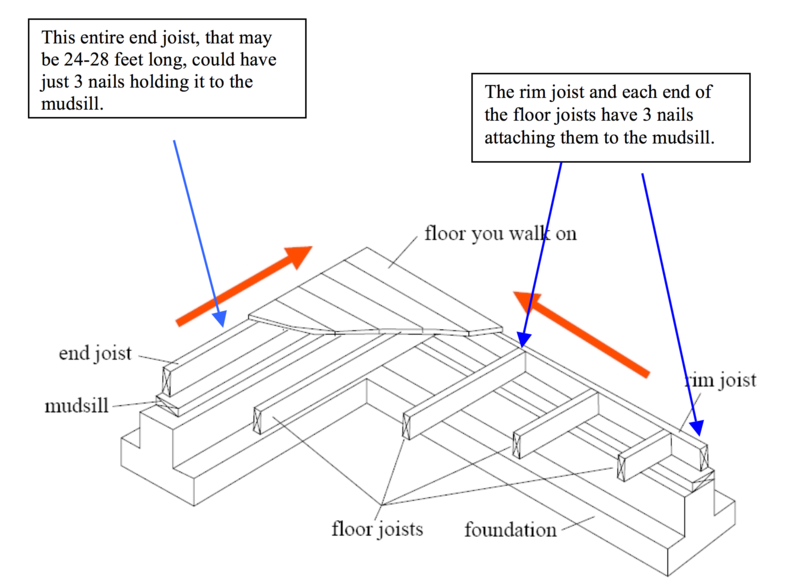 This means wherever the joists or girders sit on top of the mudsill, only 3 nails need to be installed in order to meet the legal requirements of the building code. Before the use of nail guns became pervasive, driving nails with a hammer was arduous and caused an injury known as “carpenter’s elbow.” Contractors stuck to the 3 nail minimum building code standard as a way to increase speed, avoid injury, and minimize fatigue. 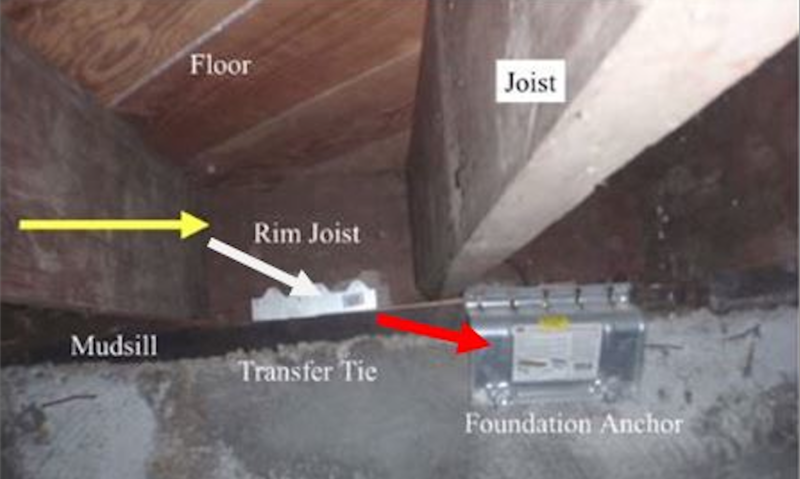 Below is an illustration of what it looks like under your house. 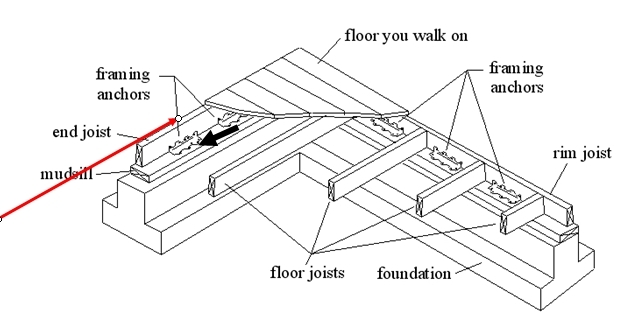 Floor joists (or girders) support the floor you walk on. These in turn are supported by a piece of redwood called the mudsill. If the floor joists or girders slide on top of the mudsill, the house can be damaged. 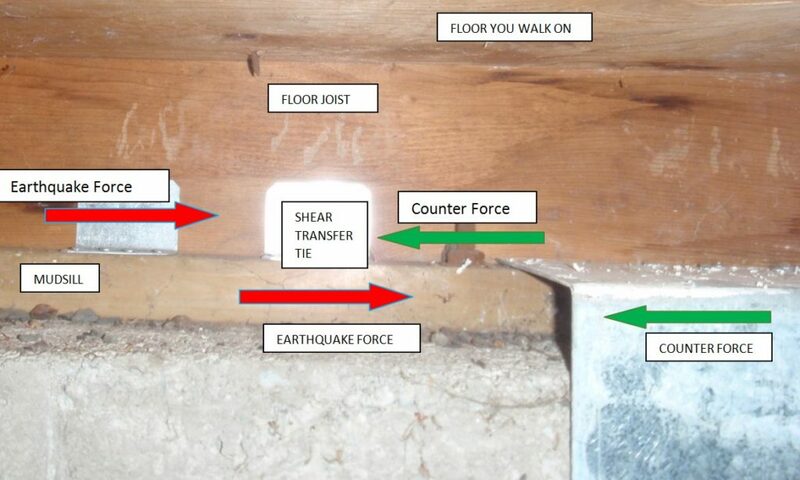 Diagram: Earthquakes exert force that may push the floor off the foundation. 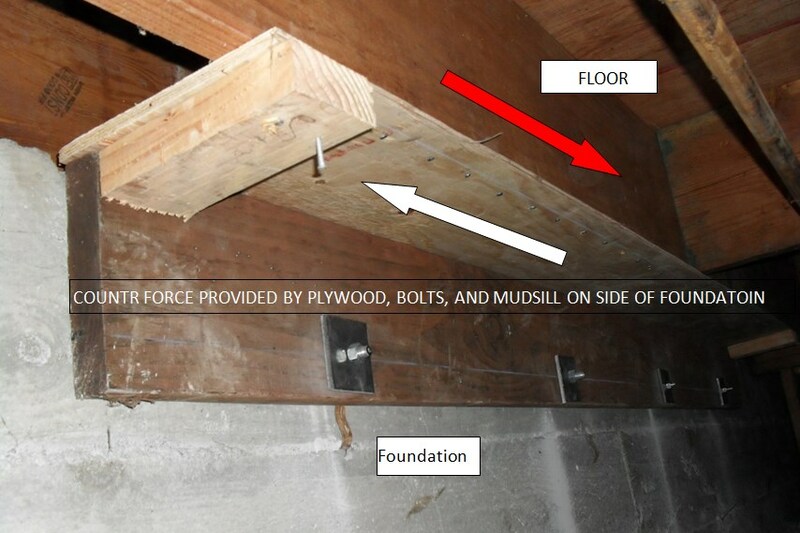 The current building code specifies 3 nails in the end joists to resist this type of force, which is clearly inadequate. After nail guns were invented, contractors may have chosen to exceed the code, but there is no way to know for sure without taking off the stucco or wood siding. In any event, houses built before 1978, before nail gun use became pervasive, are almost guaranteed to have this problem. 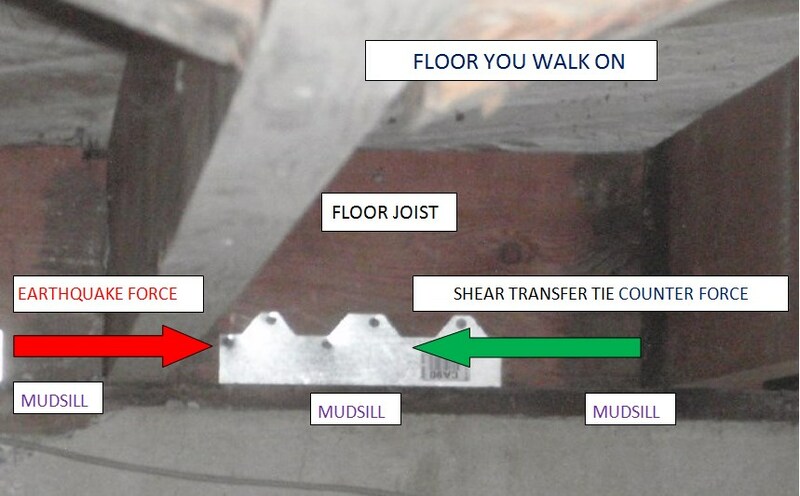 Diagram: To remedy this deficiency in the building code, special hardware called shear transfer ties or framing anchors should be used. Why Aren’t Building Codes Followed? Implementation of the Building Code is the job of the contractor. The job of building inspectors is to make sure contractors follow the code. When contractors rush their work in order to save money, seismic provisions in the code may not be implemented properly. Contractors and building inspectors also may not adequately understand the importance of seismic provisions in the code. Both of these issues may lead to poor workmanship and homes that are not adequately strengthened for earthquakes. Unfortunately, during construction, most time-pressed inspectors only have a few minutes to look at a house while it is being built, and deviations from the building code are often missed. The almost universal installation of bolts in over-sized holes, which the code forbids, is a case in point. 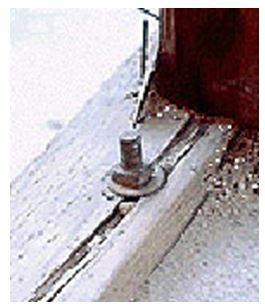 Bolt over-sizing occurs because at the time of inspection the bolts are installed with nuts and washers such that the size of the hole is not visible, and because contractors are unaware of how important this is, and because it is easier for contractors to have over-sized holes so they can adjust the mudsill. 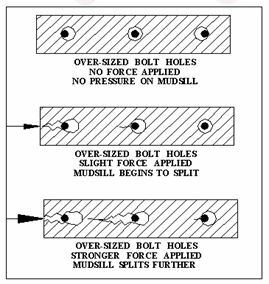 When Bolts are Over-sized they do not work together until the mudsill splits at each bolt location.